“Studies show that students have the potential to lose as much as two to three months of math and reading skills over the summer,” said MHS Vice President of Education and Student Life Dr. Freda Martine. 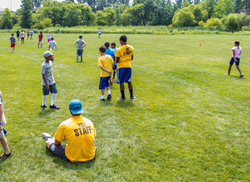 Milton Hershey School® is utilizing its Year-Round Experiences (YRE) program to keep students active this summer. The program, which ensures students have a consistent experience in a safe and nurturing environment, is based on the philosophy that learning and development happens all year long, both in and out of the classroom. For six weeks during the summer, Milton Hershey School students in pre-K through 12th grade participate in dynamic, hands-on learning. The experiences are tailored to students’ age levels and feature activities and curriculum that support their academic, social and emotional growth, as well as physical needs. In 2015, 84 percent of MHS students participated in a YRE activity. Activities include STEAM activities, field trips, cooking and nutrition lessons, outdoor adventures, sports tournaments and more. By integrating the STEAM fields of science, technology, engineering, the arts and mathematics into YRE activities, MHS helps ensure students’ minds remain sharp and free from “summer brain drain” or summer learning loss. In addition, students enhance their creative problem solving, critical thinking and team building skills. More information about MHS and the Year-Round Experiences program can be found at mhskids.org.